As Tallie Graver sat chatting with her friend Gina and her new beau, she could not help but wonder how to tell her newly smitten friend that Mr. Right might not be what he makes himself out to be. Fortunately for Tallie, in burst a woman claiming to be the wife of said questionable male. Unfortunately for Gina, she reacted with a pot full of hot as coffee threats and insults. When Mr. Not-So-Right turns up dead at the bottom of Gina’s stairs the next morning, a room full of witnesses point their fingers in her direction. Now Tallie is out to clear her friend’s name and save her business from the widow, who's on the prowl for revenge. It doesn’t help that the victims keep piling up as well as the suspect list. Tallie will have to enlist the help of her new love interest to put together the pieces before she herself comes to a bitter end. Can she get to the bottom of the love triangle, or rectangle, without getting herself plunged back into hot water? 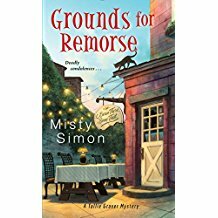 Check out Grounds for Remorse from author Misty Simon to find out. This is the second installment to the Tallie Graver Mystery Series, following the previously reviewed Cremains of the Day. You can find these titles and others from Misty in Amazon, Barnes & Noble and other fine book sellers.